Need a recipe for a tasty sweet snack? 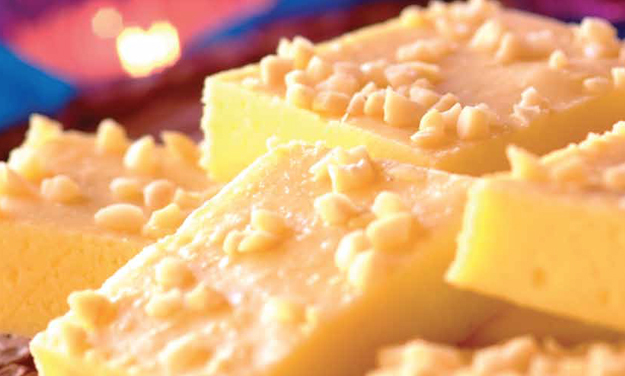 Try this easy burfee recipe for a delicious baked treat today. Stork – love to bake. Place milk powder in a mixing bowl and rub in the cream. Combine sugar and water in a saucepan, stir and bring to boil. Turn down heat, add cardamom and Stork Bake. Cook until the mixture appears frothy. This should be approximately 5 minutes. Stir in milk powder mixture and mix well until it leaves the sides of the saucepan. Spread mixture into a swiss roll tray and sprinkle almonds evenly.